Copy and Paste is one of the best features of digital arts. Is probably the most used process in homes and offices around the world, and very simple too. You need to highlight what you want (text or pictures) and then right click it and from the pop up menu select “Copy”. Then go to the desired document you want to create and paste it there by right clicking in the empty space. The copy paste process makes use of the clipboard. The clipboard is a temporary space where each piece of information is placed before is pasted. The clipboard is refreshed every time a new copy is initiated, and its content is lost when the computer is restarted. There are also Clipboard software which give more options than the standard windows clipboard, so you can research it online on the second read of this book. Depending on the application your results may vary. For example if you have Microsoft Office® installed and run Winword you will start Microsoft Word. If you want to paste the text in the middle of the page, then the cursor (cursor = blinking vertical line) has to be set at the middle of the page. 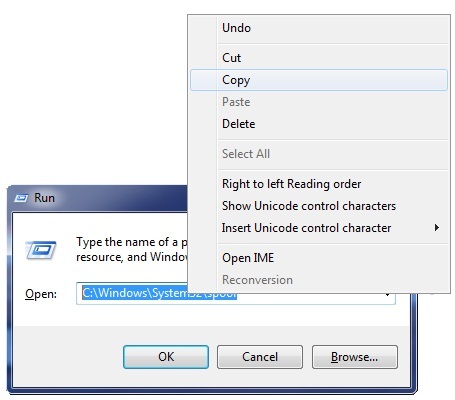 To copy any text from any source like Internet Explorer, Word document or any other app, you need to highlight the text ( Press and hold the left click of the mouse, then move it as you want to select/highlight the required text, release when you have the necessary text highlighted) and then right click on the highlighted text and select copy, or press the combo key (Ctrl+C). Paste it by right clicking in the empty space, and on the dialog box and then select paste, or use the shortcut keys combo. 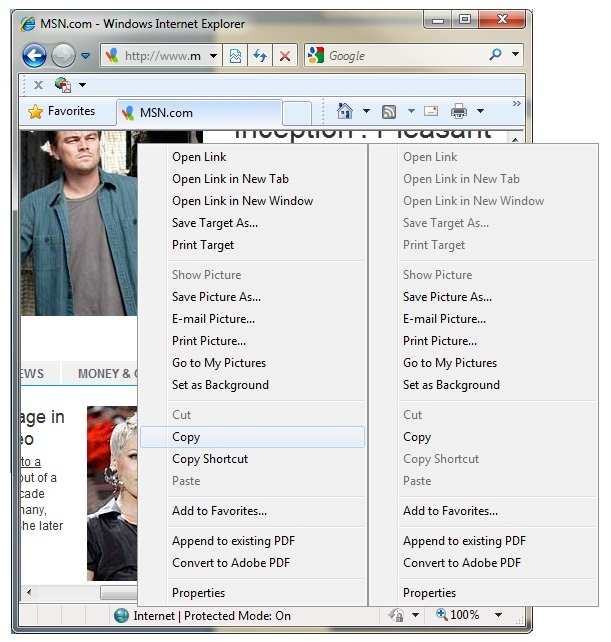 In the image below is an example on how to copy a picture from Internet Explorer®. What you need to understand is that the picture in question has multiple functions or proprieties, when you right click it you have many options available from the pop-up menu. If you look at the top part of the pop-up menu you can see that is active. That is because the image is a Link too, which takes you to another page when the image is clicked. If that image would not have been a link, then that part of the pop-up menu would have been grayed out. As you can see there are other parts that are grayed out since those features are not available. You can paste an image into an application that can work with images. For example you cannot paste an image into “Notepad”. To start Notepad just run “notepad”. However you can paste in text into Notepad. Notepad is very useful, especially when you are using internet sources for text. If you want just the text from a web-page, not the font type or the link associated with it (because Microsoft Word can understand and format links) then you copy and paste the text into Notepad and only after that you copy it from Notepad and paste it into Microsoft Word. And there you have it, only the pure text without any formatting. When I write an article in my blog = Web log, I use Word for spell-checking but if I directly copy and paste from Word into my blog, then I get the formatting from word. So I have to put it in Notepad first. The rest of tricks you can find by trial and error. Copy and paste are universal, all applications make use of it. You can also copy and paste in between applications. You can copy a picture from Internet Explorer and Paste it into Windows Paint. 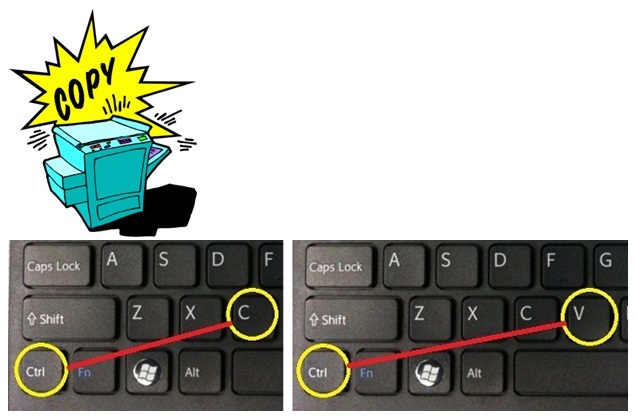 In order to use the shortcut keys for copy and paste, the applications have to be highlighted. If you want to copy text from Internet explorer into Notepad, you have to first activate, or bring internet explorer in front of all windows by clicking on it highlight your information and copying it. To paste the information to Notepad, you can’t just paste immediately after copying, especially if the active windows is still Internet Explorer. You need to click on notepad to bring it in front or activate it, and then paste the information.